Living in a one-bedroom duplex with a toddler is a bit tricky. She doesn't have her own room, or a playroom, or a yard that she can safely play in without running into oncoming traffic (which is something we try to avoid). So, without much choice, the living room serves many purposes. It's the largest room in the house, and when we aren't out and about, we typically spend most of our time there. When I need to get anything done in the morning, I make sure Eisley has a nice arrangement of playthings. Her current favorites include her box of shoes (the girl loves her shoes), a big bin of stuffed animals (which is typically kept under her crib), her dollhouse (currently occupied by a handful of marbles and the pirate), and her coloring books (all day, every day). By time she is ready for lunch, the above mess-storm has usually occurred and I'm ready for a margarita. (Okay, just kidding, but SOME DAYS.) I've had to let go of a lot of my expectations, as far as order goes. I know some parents require a child to clean up one toy before moving onto another activity (which is admirable if you're able to manage it with a child yet to turn two! ), but there's no way I can handle that all day long. So, a mess it is. And I'm learning to just deal. Ah, yes. Sweet serenity. How I welcome you. If I don't get to pick up this room halfway through my day, I feel completely off-balance. It's a necessary part of my day…so, at least for those couple hours she's asleep, I can feel like my space is my space. It's a good thing. As easy as it is to mess up our small home, it's equally easy to clean up. And for that I will never complain! Aside from my naptime pick-ups, Monday is generally my whole-house cleaning day (dust, vacuum, thoroughly clean the bathroom and kitchen, etc.) and I can get it done in one morning. It will definitely be hard to give that up once we have a house with more space. Also, I feel the need to mention that I don't let Eisley have free reign over the entire house. She does help me clean up before bedtime, and I don't let her leave a mess-trail all over the house, but at this point I do the brunt of the clean-up. Which I think is fairly typical, but I could be wrong. Pinterest makes me feel like I live in a hoarder house some days, so I don't even know. In any case, there you have it. Just a small piece of the madness (and goodness) of life with a toddler! Omg I adore your living home! So cheerful and tidy and welcoming. Er, I meant "living room," but I suppose what I typo-ed will suffice. ah, yesh. life with a toddler. SMILES SO BIG. also, HI! i've missed your blog! Big bins make my world go round!! The $7 plastic bin at Target is waaaaay better than the overpriced "toy bin." I'm pretty laid back, but my one rule is NO toys in Mom and Dad's room. That is our space and I don't need to find cars, legos and GI Joes in my bed (or at night with my feet). Even when we were in a one bedroom apartment with our first son, we kept it all out of the bedroom. We live in a house less than 1000 square feet... With four kids.as crazy as it can be, I always appreciate how easy it is to clean! Brittany, you are my hero. 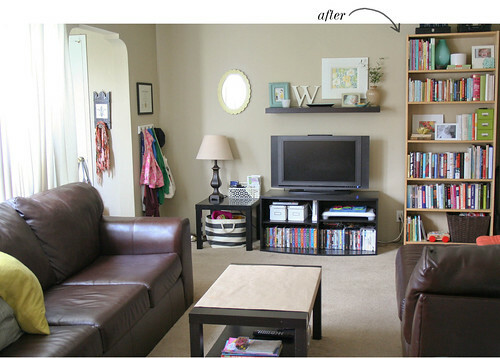 :) I love hearing about families making it work in small spaces! That's impressive! Nate would have demolished that room at that age. All those DVDs and books would've been strewn everywhere. Ugh. Our living room is his playroom, too, b/c his room is small. 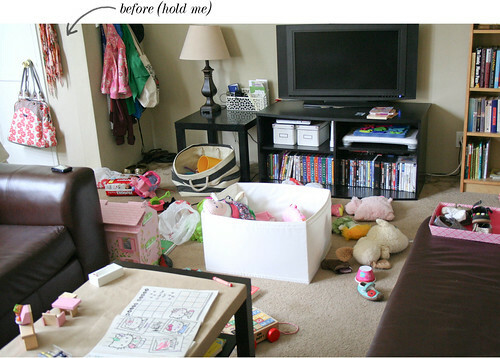 So our living room is a mess and our bdrm is a mess due to my husband. No. Respite. Anywhere. Ugh. I dream of a room like that someday. I think it looks cute both before and after. And it's so nice to see we aren't the only ones without a pristine living room 24/7. I am currently bugging out over how to handle Eli's toy storage in the living room. We have a small storage ottoman but it's not cutting it right now! Honestly, I've only been able to clean while she's awake since she hit around 14 months or so. Before she was that age, it would be too much to do with her running around, so I'd just take advantage of her first nap and dash around as best as I could before she woke up (and would just save vacuuming until she was up). I'm sure it will be easier once your little one gets older! Eisley is now familiar with cleaning day, and I'll let her walk around with a Swiffer duster and that keeps her busy for a while. I'll usually put on her favorite show and give her a snack while I'm doing something she can't be right next to me while I do (like cleaning the kitchen or bathroom). You call that a mess?! That doesn't look so messy to me, although I know anything on the floor is a mess. But it's good that you have a carpet floor, so it looks to be easier to clean. And I must say, the carpet looks great! Especially with a little toddler in the house! Unless she's not using sippy cups yet, so you don't have to worry about cleaning up any milk or juice that might spill on the floor. HOW DO YOU KEEP HER OUT OF YOUR DVDS AND BOOKS?! Where do all those toys go when you wave your magical clean-up wand? I am aspiring to be more organized, but at this point I feel like the toys have taken over permanently. I mean, we have a train table as our coffee table, for crying out loud!